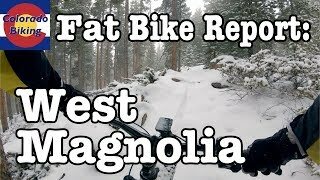 This ride connects together some of the best trail work done in the West Magnolia area for a close-to-town amazing trail experience. This trail connects Sugar Magnolia #926 with the rerouted Aspen Alley Trail #342A, the rerouted Lookout Trail #926, the Observatory Trail #355, Re-Root #927, the rerouted Whoop-Di-Dos Reroute (926.1F), and back to Sugar Magnolia #926. What used to be a spaghetti network of eroded-out trails hammered by years of neglect is now one of the most fun and progressive rides in Boulder County. Lookout, Aspen Alley, Whoop-Di-Dos Reroute (926.1F), and Re-Root #927 all have fun and challenging alternate lines. There is a new section on Aspen Alley that was a road-to-trail conversion by the Boulder Mountainbike Alliance which turned this section from a cupped out straight-as-the-dickens logging road to a flowy trail with jumps, berms, and rollers. But the area is still not easy to navigate. Bring a map to make sure you are on the right track. And if you want a longer ride, there is a lot more trail in the area - from the Hobbit Loop to School Bus #929 and beyond. Some of this trail has only just been constructed in Fall of 2017. Please be on the lookout for trail closures while construction is completed. This ride can be done from the RTD Park and Ride in Nederland, the parking at Nederland High School, or the parking at the West Magnolia Trailhead on the Peak-to-Peak Highway just south of Nederland. The route here starts from the RTD Park-n-Ride in Ned, but you can modify these directions to work for the other parking areas. From the RTD Park-n-Ride, head south along the Peak-to-Peak Highway before ducking into the neighborhood west of the highway. Nederland Parks and Recreation has designated some of these streets as a path connection that will take you to Nederland High School. After winding your way through the neighborhood, there is a short path that takes you uphill to Eldora Road. Note the big rock ramp on your left - you may want to hit it on the way back down later. Head west on Eldora Road for about a mile until just before Nederland High School - there is a trailhead on the south side of the road here for the Sugar Magnolia #926 trail. Climb Sugar Mag trail until you reach the intersection with the Aspen Alley trail. Take a right (or head west) and climb. This trail ends at the end of Haul Road. Cross the road and take the Lookout Trail #926 to climb up and over a ridge. Drop down the other side. Once you hit a doubletrack road, look for the first singletrack trail to your left. This is a nice shortcut to a campsite next to the Observatory Trail #355 - a short twisty blast through trees. Go up the campsite driveway and cross the 355 road to get on the Observatory Trail, which ends at the main parking lot for the West Mag area. From the main parking lot, head east/southeast and you'll find a singletrack trail from the lot that takes you over towards Re-Root #927. You'll have to pass the entrance to Hobbit to find the singletrack for Re-Root off of the road. Keep your eyes open on Re-Root, there are about four to six major alternate lines requiring sometimes significant skill (not all entrances to these features are obvious). Cross Haul Road and continue on Re-Root #927 for another quarter of a mile to the fork, and take a left onto Aspen Alley Trail #342A . Climb this nice singletrack until it tops out and begin descending. There is one trail intersection where you'll want to bear right another to stay left to stay on the new Aspen Alley trail. This part of the trail is extremely fun - with rollers, jumps, and berms with a number of alternate climbing lines. After this section of trail, you face a choice - continue down Aspen Alley and back to Sugar Mag and back to town, or turn left at the next trail, climb up the Whoop-Di-Dos Reroute (926.1F) to do one more lap on this super fun section of Aspen Alley. We recommend the latter. The Boulder Mountainbike Alliance (BMA) has been working in this area for a very long time, from getting the original social trails legitimized when the U.S. Forest Service (USFS) was considering what to do about them back in 2003 to advocating for a dramatic expansion of the legal trail system when the USFS decided to tackle the issue of social trail proliferation in a process that came to a close in 2016. The USFS recently approved the Magnolia Non-Motorized Trails Project, and BMA is helping to secure funds to help the USFS implement that project. This long-term involvement of BMA with the USFS has allowed for some very creative and progressive trail design and construction. The Nederland Area Trails Organization (NATO) has led some volunteer trail projects in this area as well, including the Lookout Trail #926. Additionally, crews of local residents are working with the Forest Service to preserve the natural character and uniqueness of the West Mag and Nederland area. Nice work BMA and volunteers! This new lollipop is running great! Rolling through the aspens on Re-Root. Parts of the trail are just as they always were. "Look out" for awesome fall colors on this trail. A bit of forest less affected by the tree removal. A few wilderflowers on their way.